ALAMOSA, CO -- A Colorado boy is fighting a rare skin condition that is essentially turning his body into stone. The condition is so rare, only 40 additional cases have been confirmed. For as many doctors as Jaiden Rogers has visited, you would think someone would be able to help him. "People don't get it, mainly because people don't know what it is, no one's ever heard of it," dad Tim Rogers told KDVR-TV. "It's almost, if you took your finger and tapped on his arm, it's almost like tapping on a counter top, on a hard surface," said Tim Rogers. The spots have spread to his legs, back and hips. And it's made walking difficult. "He just matter-of-factly says I need a wheelchair. And I was just..." said mom Natalie Rogers. "He said, 'My legs don't work anymore. I need a wheelchair,'" Tim Rogers said. Doctors eventually determined it is stiff skin syndrome. "Its kind of outrageous sounding when you say a boy turning to stone, they just - people can't get that through their mind, and basically that's whats happening," said Natalie Rogers. With every passing day, the symptoms get worse. "He does tell you it hurts. He doesn't really - I don't know if he can describe how it feels," Natalie Rogers said. There is no cure, and really no treatment. "I had kind of exhausted the medical library trying to come up with something myself," said Dr. Elizabeth Swanson, Advanced Dermatology. But Jaiden's doctors continue to try everything, including his latest round of chemotherapy drugs, usually used to treat cancer. It seems to be slowing the spreading. "The unfortunate thing with stiff skin syndrome is that once the skin has done this, that area is kind of done. Were not going to be able to bring back normal skin to that area. But what I am hopeful of is this treatment helps prevent the spread of it, you know, holds it in its tracks. That would be a win," said Swanson. And it would be a win for future victims of this terrible disease. "Maybe we are a little bit too late to really make a huge profound significant difference for Jaiden because of what is already there, but the next patient that gets diagnosed with stiff skin syndrome can start on this medicine on day one of diagnosis and stop it at that point in time," Swanson said. For now, Jaiden's parents say physical therapy is one of the only things they can do. And they have learned the community in their small hometown of Alamosa is there for them. "Our goal was to have a therapy pool living in Colorado. We wanted to be able to use it year round because that's where he does his water therapy. They did a fundraiser for us very quickly, like, six hours, raised $80,000 to build us a therapy pool that is enclosed; it's a swim spa," Tim Rogers said. They say they will explore every option. "You love him so much you don't know what to do. You try to fight for everything you can, but you don't know how to fight in this case. You don't know what to fight for," Natalie Rogers said. His parents say Jaiden is a survivor. And though his skin may be tough, he has a soft spot in his heart. 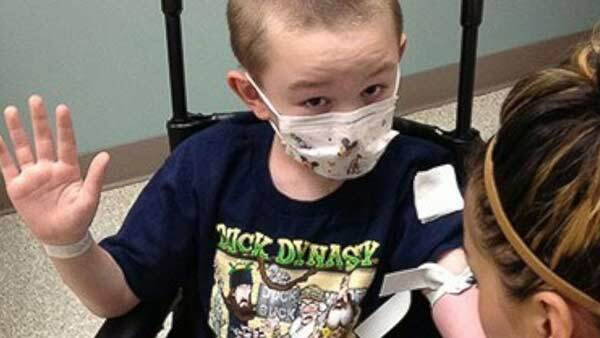 Jaiden's parents are now considering treatment options for their son in Europe.